Marie-José Pérec, the rightful 400m world record holder in my eyes. Medals are owned, records are borrowed. That is how Carl Lewis replied to a Twitter comment about how he and Leroy Burrell are coaching athletes that are breaking their records. The quoted mantra about the significance of medals in comparison to the “borrowed” world records is often repeated by the great athletes who were fortunate enough to experience what it’s like being at the top of the podium and on top of the world. I wanted to reply by saying that you cannot borrow records anymore if you’re a female sprinter, but I bit my tongue. I didn’t want to be that one guy who always brings up doping. There was a lot of excitement on social media in light of the recent NCAA indoor Championships where college athletes broke numerous records, including a couple of world records. The depth of performances made it one of the best indoor meets of all time. In many ways it even overshadowed the recent World Indoor Championships in Birmingham. The kids are getting faster and stronger. Teenagers are now equaling performances that were reserved for Olympic finals just a generation ago. This is in no small part made possible by better tracks, better footwear, better dieting, better coaching & science, and also by the fact that athletics is now a full-time profession. But something is not right. If you closely examine the times and performances, you will see that only men are threatening the world records of non-technical track events, whereas women are getting nowhere close. So as I watched the likes of Sydney McLaughlin run an incredible time of 50.36 in the 400m at just 18 years of age, I was once again reminded of the sad reality that she and her competitors will probably never have a chance of breaking the 400m world record. It’s the record I despise the most because a) it’s so laughably outrageous, and b) it’s in my favourite track discipline. 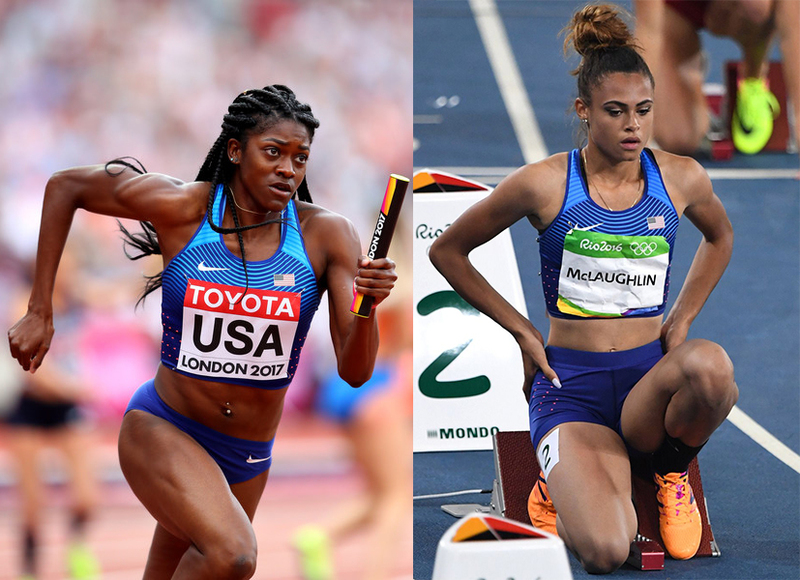 Kendall Ellis and Sydney McLaughlin, paving the way for a new generation of sprinters. Will they ever run 48 seconds? The last sub 49s time was run in 2009 (48.83 by Sanya Richards-Ross). Track fans like myself get really excited when a female athlete dips below 50 seconds in the 400m. It’s the mark of a true athletics prodigy. Getting close to or under 49 flat is a sign of greatness. The world record stands at 47.60 … I get a tingle of anxiety just thinking about that number. Since the world record was set on October 6, 1985 (32 years ago), there have been 9 clockings below and including 49.00s by 5 women (excluding the world record holder Marita Koch). Best yearly performances in the women’s 400m. The trend line (pale linear red line) indicates a gradual regression. Click on the image to view full resolution. If we look at the men’s event, you have to run 44.30 to be within 2.86% of the world record of 43.03, set on August 14, 2016. There have been 21 clockings below and including 44.30s by 10 men in the last 1 and a half years (excluding the world record holder Wayde van Niekerk). You don’t have to have a degree in statistics to figure out that something is seriously wrong here. In a highly competitive sport like track & field, there shouldn’t be that big of a drop-off from the top athletes of the past to the top athletes of the present. Especially when it only happens to one gender. Best yearly performances in the men’s 400m. The trendline (pale linear blue line) indicates a gradual progression. Click on the image to view full resolution. It’s true that there is going to be a time when the athletes will reach a plateau in every discipline (unless the sport openly embraces doping and bio-engineering) and I think it’s obvious that men are already reaching for the ceiling in most sprint events, nudging the bar further by fractions of percent at a time. But I cannot accept the fact that women ran under 49 seconds for 9 straight seasons (1978-1986) — right before out-of-competition drug testing was introduced. The performances before 1987 should be annulled in my opinion, simply because the testing was laughable by any standards. We all know that doing so wouldn’t solve the problem because people were still doping afterwards, but it’s likely that women weren’t able to use the most potent stuff anymore. And they must have been taking something truly potent to achieve those unreachable times. Not to mention that all of the fastest times in the eighties were achieved by the East Germans, Czecho-Slovakians and the Soviets. And we know that the East Germans used CMDT (branded as Oral Turinabol), sponsored by the government. The drug that apparently significantly promotes muscular endurance — which is paramount for success in the 400m. Even if some of the best results after 1986 are tainted, I still believe that Marie-José Pérec is a much cleaner example of what women are actually capable of. In my regard, her performance at the 1996 Atlanta Olympics is the true world record in the 400m. *Though it has to be said that Allyson Felix split a 47.7 in the third leg of the 4x400m final at the 2015 World Championships in Beijing, so it appears that not all is lost for the ladies just yet. It’s unfortunate that she couldn’t get anywhere near that time in the individual 400m. At the very least she proved that she had sub-49 in her legs. I certainly agree with your assessments and conclusion in this study. Though we can better define the principles associated with speed and related subjects, it would require some outlier type physiological abilities (not discounting primary constants required to achieve relative contact length and time) to overcome Koch’s 400 footprint from ’85. At least without the high pharmaceutical support she more than likely had! My opinion only of course. Certainly work will be required to improve in areas such as GRF over the complete duration of the event. And of course, I’m comparing to the performances of Perec – not one where highly crafted and engineered pharmaceutical support were perhaps provided to the record holder. Though this young lady, IMHO, has sufficient qualities in place, to begin with, where contact length and sprint gait are concerned. I truly believe with her prior background in short hurdles (13.x) and horizontal jumps (6.2m), the short speed might be underestimated. However, I like the fact that UK is focusing more so on sprinting to start as opposed to hurdling. Evelyn Ashford was the best 100m runner, FloJo couldn’t touch her until she..you know…juiced up, then retired after the WR’s. It looks like the world has at least two present day female quartermilers approaching Perec’s all-time best. Shaunae Miller-Uibo and Salwa Eid Naser are making a case! And both quite young. Yeah, for sure. Miller and Naser are really exciting to watch at the moment. You just know that they are gonna light up the track, especially when they line up together, like we saw last week. But 48.25 is still far away. It’s almost like comparing 43.9 with 43.25. Which makes the 47.60 an even more depressing mark as it’s more than half a second quicker than 48.25! Very good point. These young women are “moving” quite different than the ladies past. And training, as well as recovery protocols, are so much better. In addition, there are a few others on the hunt (e.g., Irby, McLaughlin).